Our philosophy of education centers around play. Play is the most complete educational process of the mind. This allows the development of the "whole" child – intellectually, socially, emotionally, and physically – and facilitates the natural unfolding of each child's potential. In return, the child experiences a growing sense of self-worth and a personal joy in learning. Young children learn in a different manner than do older children. Young children learn by actual contact with real objects, events, and people. (That's why field trips, outdoor play, and other exciting activities are so important.) Young children learn by involving themselves in exploring, discovering, repeating, and by continually adapting what they see into their daily lives. Young children are not yet prepared to learn by words alone. They do not learn by explanations or descriptions of things that are far off in time or space. Just because young children can repeat words easily, does not necessarily mean they understand and grasp the meaning behind the words. It is only through varied, first-person real life experience that words are filled with meaning for the young child. 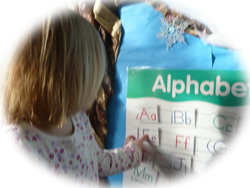 Preschool is a time to begin learning independence, while developing trust and respect for others. An important part of this program is social adjustment, sharing and cooperating with others. Our goal is for them to "want" to come to school by stressing that "learning is fun." There are many skill levels and unit topics covered during a school year, and we try to make all of it fun and interesting. Included in these units are numerous projects and many forms of art for enhancement. Most important of all is the child learning to see himself/herself as an individual who is unique with qualities unlike any other. 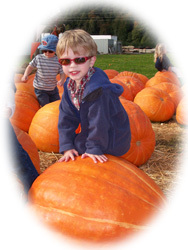 We take exciting field trips each year to destinations such as the Pumpkin Patch/Farm and StoryBook Theater. The kids have a wonderful time dressing up on Spirit Days such as "Pajama Day," "Crazy Hair & Hat Day," or "Pirates and Princesses Day!" Each year, some very special educational and entertaining guests visit us at Highlands Preschool. These may include a storytime visit from the local librarian or a great show from a performer such as Xakary the Magician! This is usually the first school experience for the Early Threes. It is a time for the child to develop independence, learn and expand social skills, and build a sense of himself/herself as a problem-solving and reasoning individual. 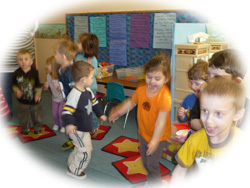 Our Early Threes program includes story time, a daily art project, movement to music, and group activities. These allow the child to develop a curiosity for life and a way to express his or her individuality. e.	Answering "Question of the Week"
The three year old needs to build a sense of themselves as a problem-solving, reasoning individual, while developing trust and independence. This is accomplished through many play experiences. Play is a key mode to development. This program includes daily art projects, skill builders, circle time, and group activities. These allow the child to gain a greater awareness of his or her individuality. f.	Answering the "Question of the Week"
The Pre-K program will help your child gain the skills and personal readiness necessary for kindergarten. 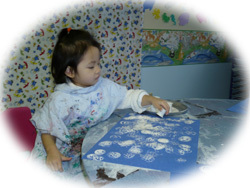 This program includes daily art projects, skill builders, circle time, and group activities. These allow the child to gain a greater awareness of his or her individuality. Letters and their relation to sound are introduced. We will emphasize understanding of number concepts as opposed to learning to count by memorization. Your child creates his or her own art work and will be proud of their own creation. Good development of fine and gross motor skills must occur before your child is ready for prolonged seatwork in kindergarten.